The agritourism Monte Pozzali is situated on the top of a hill, within the heart of the Tuscan Maremma, where once was placed the Convent of Monte Pozzali. Years ago only ruins, which were transformed then into rural farm buildings, in which are today situated 13 holiday apartments from 45 sq.m. to 90 sq.m. 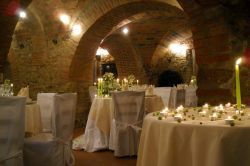 A beautiful farm restaurant in the antique convent cellars, where stone walls and archs are creating a very special atmosphere. Here guests might enjoy the typical local cuisine for breakfast or dinner. 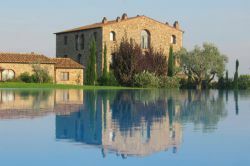 It is also possible to rent the restaurant, the veranda in front or the swiming pool area (pool opened from May to October, 16 x 8 m) for an unforgettable wedding in Tuscany! The Monte Pozzali holiday farm is run by Elisabetta and her family, who are trying their best to make your stay as pleasant as possible. At Monte Pozzali are living also some horses, cats and an adorable German shepard dog. Situated in a peaceful position, far from noise, but near enough to easily reach the next statal road, one might enjoy complete relaxation in the garden, under the veranda or at the swimming pool. 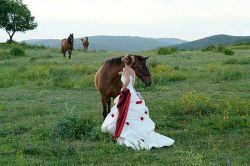 It is also possible to walk across the farmland, encountering Elisabetta's beautiful horses. From the estate it is possible to enjoy a marvellous view over the gentle hills that are alternating between olive trees, vines, green and wood. On the hills nearby, one can still admire the ruins of the antique castle dating back to the 11th century. In the following centuries, it became one of the most important fortresses of the Republic of Massa Marittima. Only a few kilometers away there is the lake Lago dell'Accesa with Etruscan findings, the medival Fort of Perolla and furthermore the ruins of the historic Stone Castle (it. Castello di Pietra). Because of the nearness to the sea and the most important cities of art, one can choose between a holiday of complete relax or the combination between a relaxing holiday and discovering the most important places of art and culture. Only 10 km away is located the so called "medieval pearl of Massa Marittima", also birthplace of St. Bernard. The near seaside resorts such as Follonica with its long, sandy beach, Puntone di Scalino, the exclusive Punta Ala and in the end the medieval town of Castiglione della Pescaia are inviting with their marvellous beaches and bays. Not to forget, even the islands of the Tuscan archipelago that can be reached from Castiglione della Pescaia, Piombino and Porto S. Stefano, further south of Grosseto. Who prefers to follow the traces of the Etruscans, can visit the near Vetulonia, Roselle and more towards north, the Etruscan settlements of Populonia. Within one hour it is possible to reach Volterra, the Abbey of San Galgano and Siena. The numerous national parks (Parchi di Val di Cornia and Parco Naturale della Maremma) are waiting to be discovered. Whereas those, who would like to get to know the antique Tuscan traditions can visit the local festivals (Balestro del Girifalco) and taste their typical dishes. Even those who are keen on nature and sport, either for water sport as for other sport types, will have a very good time at Monte Pozzali. Nearby there are trekking routes and it is possible also to go riding within the marvellous hills, along the beaches or to go diving or sailing.